By Mike Smith: HBO was supposed to be ending their 45 years of boxing coverage on October 27 with the Daniel Jacobs vs. Sergiy Derevyanchenko fight, but they’re also planning on a December 8 tripleheader headlined by WBO junior middleweight champion Jaime Munguia (31-0, 26 KOs) facing an opponent still to be determined, according to Dan Rafael. The location of Munguia’s fight still hasn’t been decided. As part of the possible tripleheader, former four division world champion Roman ‘Chocolatito’ Gonzalez (47-2, 39 KOs), as well as Cecilia Braekhus (34-0, 9, the women’s welterweight champion. 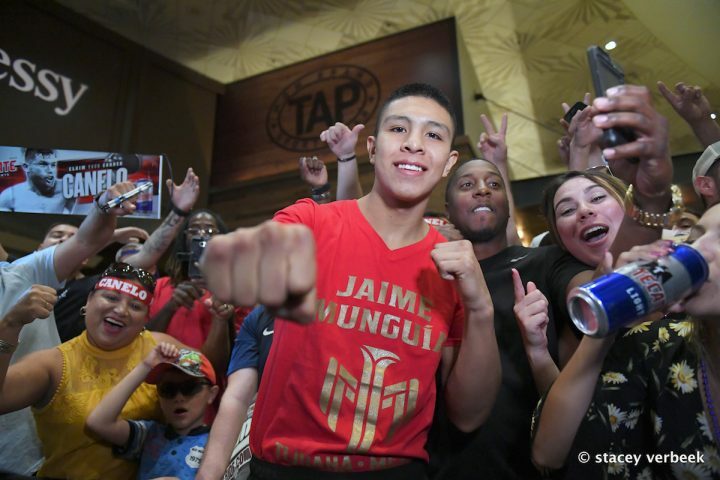 The 22-year-old Munguia is a fighter who is being groomed for stardom by Golden Boy. HBO getting out of the boxing business means that they won’t be able to turn Munguia into the next star for their network, and one day replacement for Saul Canelo Alvarez. Munguia has tons of potential, and he’s still very young. Munguia is just now rising to prominence with with victories over Sadam Ali, Liam Smith and Brandon Cook. Munguia’s co-promoters at Golden Boy Promotions haven’t said who they plan on matching him against, but it’s likely that it’ll be one of the World Boxing Organization’s top 15 contenders. Munguia’s last opponent was #3 WBO ranked Brandon Cook. There are a number of contenders that would be perfect for Munguia to fight on December 8 from the WBO’s top 15. Liam Williams (18-2-1 13 KOs) would be the funnest potentially for a fight against Munguia on December the 8th. Williams, 26, is a fighter with huge power in either hand, and he likes to come looking for early knockouts. Williams is one of those fighters who maintains his punching power even late in his fights. The things that has hurt Williams’ career is his stamina problems and his cuts. Williams would make for a very, very interesting opponent for Munguia to face on HBO. The question is would Golden Boy Promotions be willing to put Munguia in with a slugger like Williams? Munguia has got to be able to beat fighters at Williams’ level for him to hold down his WBO 154 lb title for any period of time, as there are unquestionable more talented contenders in the WBO’s top 15 rankings such as Erislandy Lara, Kell Brook, Amir Khan and J-Rock. If Munguia’s handlers are hesitant to match him against the heavy-handed Williams, then they’re fighting a losing battle in trying to shield him from the harsh reality of being a world champion. You’ve got to be able to beat the tough contenders if you want to hold onto your belt, even if you’re trying to milk your title. Yoshihiro Kamegai (27-5-2, 22 KOs) is another great option for Munguia. The 35-year-old Kamegai has been in with the likes of Miguel Cotto, Robert ‘The Ghost’ Guerrero and Jesus Soto Karass. Kamegai is slow, easy to hit, but powerful. If Munguia wants an opponent that is going to stand in front of him and slug all night long, Kamegai is exactly the guy that he needs. The 5’9” Kamegai has never been knocked out before during his 13-year pro career, so it would be a major accomplishment for Munguia if he could stop him. Cotto had zero success in trying to KO Kamegai. However, Cotto didn’t really seem to try and stop him. Cotto was more focused on not getting hit by the heavy-handed Kamegai, who is similar to Antonio Margarito with the way that he walks down his opponents and bludgeons them into submission. Munguia can possibly stop Kamegai if he’s willing to stand in front of him and make it a war. Munguia won’t likely KO Kamegai if he’s going to hit and move like he did at times in his fight against Liam Smith. Munguia has got to be willing to stand and trade to get Kamegai out, and if he does that, he’s going to get hit a certain amount of times along the way. Lara, 35, is too advanced for Munguia to be facing right now. Although Lara lost his last fight to Jarrett Hurd last April, it was a close encounter with both guys taking heavy shots. Lara (25-3-2, 14 KOs) eventually wore down from the relentless pressure that the younger, bigger, stronger and fresher 6’1″ Hurd put him under. Roman Gonzalez, 31, snapped a two-fight losing streak last month in stopping former minimumweight champion Moises Fuentes in the 5th round on the undercard of Saul Canelo Alvarez vs. Gennady Golovkin 2 rematch on September 15 in Las Vegas, Nevada. Chocolatito had lost his two fights before that against the powerful Srisaket Sor Rungvisai, and he’d also looked bad in beating former WBC super flyweight champion Carlos Cuadras in 2016. With a lot of boxing fans seeing Gonzalez as a shot fighter, he looked great in beating Fuentes with ease. However, that was a guy that was made to order for Gonzalez and not one of the major players in the 115 lb weight division. Gonzalez-Fuentes took place at 115. The reality is Gonzalez doesn’t have the size or the power to beat the best fighters at super flyweight. He’s moved up three weight classes since he turned pro in 2005, and it’s clear that he’s moved up one division too much for his body. Gonzalez is said to be unable to lose the three pounds that he would need to for him to fight at 112, so he’s stuck at 115, and not able to dominate like he did at 105, 108 and 112. It’s not likely that Gonzalez will be matched up against a tough opponent on December 8 like Rungvisai, Khalid Yafai, Donnie Nietes, Jerwin Ancajas or Juan Francisco Estrada. Gonzalez needs to be able to beat those types of fighters for him to be considered one of the best at 115, but it’s unclear whether he can. In Gonzalez’s two fights with Rungvisai, it was already established that he simply can’t beat the Thailand fighter, so there’s no point in having him fight him a third time. Gonzalez looked just as hittable in his last fight against Fuentes than he had in his fights against Rungvisai and Cuadras. This suggests that Gonzalez hasn’t improved his game enough for him to be put back in with Rungvisai. It would be interesting to see Gonzalez face Cuadras, but he would take a lot of punishment if he faces him again. Gonzalez isn’t cut out for the super flyweight division with the way he likes to fight. An ideal opponent for Gonzalez on December 8 would be McWilliams Arroyo. Gonzalez has already beat Arroyo before in 2016 by a one-sided 12 round unanimous, but things have changed since then. Arroyo has looked good in beating Cuadras before losing his last match against Kazuto Ioka. Gonzalez should look to face Ioka, Arroyo, Koko Eto or Miguel Gonzalez. These are guys that Gonzalez absolutely must be able to beat for him to be relevant in the super flyweight division. If Chocolatito can’t beat those guys, then it’s time to retire or make the sacrifices he needs to for him to melt down to 112 or 108. It’s possible for Gonzalez to take weight off, but he would need to sacrifice some muscle to get those last three pounds off.